So I was kidding in that headline, but then you guys don't know how close I got to writing "this is my gram-ma(r)nifesto". 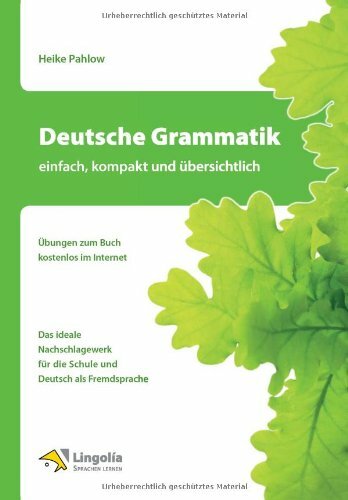 Today I want to introduce a grammar book that has made explaining German a lot easier for me. It's called, rather creatively, Deutsche Grammatik and written by Heike Pahlow. then this one's for you. Okay, so just in case you are thinking "Isn't this supposed to be the fun language blog? ", give me a chance to win you over. Grammar is one of those things - never noticed when it's done right, but always when it's not. As a language learner, this thought is likely to make you feel you're playing a game of Mikado with shaky fingers, and your impulse might be to stay away. But fear not, first of all remember that the rules in your grammar book are not invented by people as the law of language. Imagine watching a bunch of men in shorts running around a green field. In the middle, there's a guy dressed in black, he has a whistle and does a lot of pointing. The guys seem to be sharing one ball, for some reason half of them run this way, half run the other way. Now six of them have fallen over, the ball has gone to the edge and everyone is screaming. It's chaos! If you recognised what I just described as football (soccer, Americans), you know what rules can do for you. They make a messy bulk of people into a world cup winning team. And they will make a completely messy bunch of letters, words and sounds into working sentences. Remember this: It's the other way round. Grammar describes what language is doing so that you can get involved. The chaos would exist anyway. But let's return to why Deutsche Grammatik is my pick for best printed resource. I like this particular grammar book because it's got all the things you want from a good handbook: Easy structure, detailed index and tables that make a lot of sense. The book is written in German so early learners may need a dictionary or a native speaker at hand. Pahlow uses straightforward examples and provides quite an extensive glossary in the back. You may need it when words like Konzessivsatz come into play. Add to that an encouraging colour scheme (that means lots of green, not much else) light weight and compact size, and I think we have a winner. If you want to stay on screen, two great online grammar resources for German learners are the German is easy blog and about.com 's language section (both aimed at English speakers). Good news! Randy Glover pointed out recently that you can also access this book in the form of an iPad app, complete with explanations in English and also some exercises. It's the tables that really make this a great resource, so I'm very happy to see that they kept this feature for the app. There's an ebook too so you can use it on the kindle and nook and those things, all on the Lingolía website. Thanks for reading this article on Fluent, the Language Learning Blog. If you are feeling stuck right now, why not subscribe to Fluent and check out our language book shop.